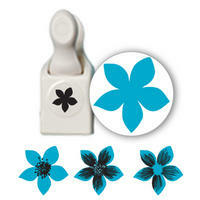 This flower stamp and punch tool has two different functions that allow you to create perfectly shaped cutouts of a stamped butterfly image. Add the shapes to cards, party favors, and scrapbooks. You can also use the stamp and the punch separately for more fun options.